"While the FCC decided to rollback Net Neutrality protections last month, the fight isn't quite over - Join us once again to write letters to representatives asking them to protect Net Neutrality through the Congressional Review Act. 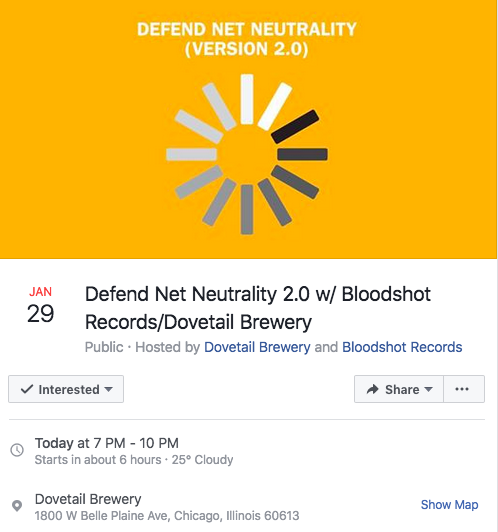 Bloodshot Records will be on hand to set the mood, and Dovetail will provide everything you need to write your rep."
Commissioner Disappointment, otherwise known as Rob Manfred, has the backs of his tanking teams' contemptible behavior. From strength bras to Atomic Lighters, what worked and what didn't. More than half the oil in global trade is stolen goods. I didn't know iguanas lived in trees. And I didn't know they fall when they freeze. On This Day In Beachwood History . . .
2015: Willie Wilson Buys Instant Credibility. 2014: Barack Obama's Familiar Empty Threat (And The Media's Journesia). 2016: Bruce Rauner's Elephants And Cornfields. "Every weekend car culture gather in the city. If you're a regular then you know exactly where this location is." Copyright Royalty Board Boosts Songwriters' Streaming Pay Nearly 50%. How Hedge Funds (Secretly) Get Their Way In Washington. We Can't Win In Afghanistan Because We Don't Know Why We're There. Trump Launched Campaign To Discredit Potential FBI Witnesses. None of the rock awards were televised at the #Grammys. Best Rock Performance went to Leonard Cohen, who died in 2016. Please kill the Grammys next. The Beachwood Tronc Line: Kirky.